Everyone wants to be healthy, but health is heavily affected by the environment, we live in. Most of the time we spend at home, sleeping and bathing, spending evenings in the family circle in the living room and in garage, occupied with our car. How to make our home clean and healthy? It’s hard to keep every inch of your house clean and free from bacteria! Fortunately, Crystal Cleanings, a large cleaning company, working in Seattle Washington Area, offers its residential janitorial cleaning services, which are developed to keep your house clean and safe from all kinds of contamination. One of the most important services among its programs, janitorial service is taken very seriously by Crystal House Cleaning. We know that thoroughness and 100% guarantee of its efficiency are essential for janitorial cleaning, and that’s why we offer you our services. hardworking and eager to help you dispose of any threat, that may be in your house. We understand that janitorial cleaning service requires 100% precision and professionalism, and we guarantee that our work will be the most efficient and trusty. Crystal House Cleaning janitorial team will arrive at your house immediately, bringing the most contemporary technics and methods to make your house sterile and safe from any illness. They will dust your furniture, remove any pollution and contamination on your floors, clean your carpets and process every surface in your house to make it sure that nothing harmful for your health remains. After that they’ll do the final cleaning and ascertain again, checking it very thoroughly. Usage of health and nature friendly substances, which grant 100% disinfection and are absolutely harmless for human and animals, combined with such techniques as high filtration vacuums makes janitorial house cleaning efficient and safe. We also care about availability of our janitorial cleaning services, offering you the most affordable prices for the quality cleaning we provide. 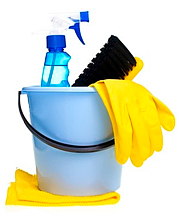 Order our best janitorial cleaning and see for yourself!